A Year On ….. And still just beginning! It is just a year this week when I started painting in encaustic wax. I ordered my encaustic iron and stylus on the 2nd April 2011 and it arrive a couple of days later, and I haven’t looked back. To read my history of art and how I discovered encaustic art please read my artist profile page on the Art In Wax website. Over the last year I have discovered the wonders of working with wax, how this medium lends itself to many different techniques, I have tried many of these and still lots to try. I have experimented with different ways of painting in wax and on different surfaces and materials. I have started to develop my style of painting in wax and although I still love some of my earlier work I can achieve much more now than then, details and texture are now much more part of my finished works. 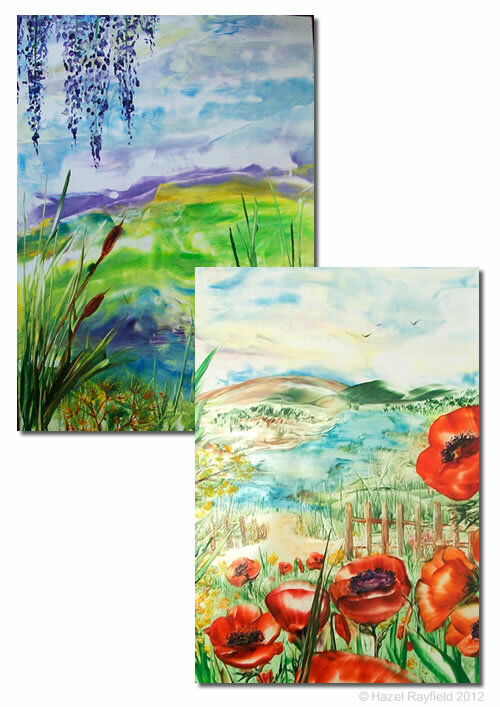 As you can see from the paintings here, this “Poppy” landscape was painted in March 2012 and the other “Wisteria Lake” last year in the summer time, both A3 in size but very different. After painting for a few months it was suggested that I might show my work and maybe sell some of my pictures, which to my delight was what has happened! and my paintings are now as far a field as the US and Greece, plus many nationally in the UK. I have online stores in two large retail outlets Folksy and Etsy. As a web developer for my business it also seemed natural to have a website which we built and launched in September 2011, mainly as a gallery for my work, which has already grown to include three catalogued gallery pages, an exhibits page, an online shop and this blog, which I love to write and share all things encaustic that are going on with me and my art in wax. My paintings have also been seen on TV – Michael Bossom asked me if he could use some of my pictures as part of his demonstration show last year, which was very exciting seeing my paintings on screen! Some sceen shots from the show can be viewed in this article about the show. 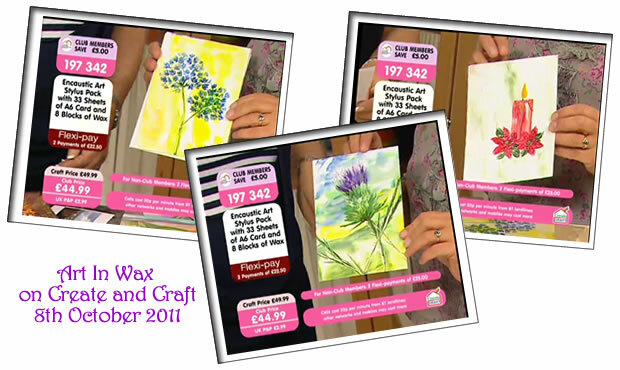 More recently in January 2012 Adrian and I created two video demonstrations of me painting my encaustic roses, which are online at youtube and we are amazed by the response they have received. And I have met (virtually) some amazing artists, especially when I became a member of encausticworld.com, an online encaustic artist network based in Canada and other people with a passion for encaustics and painting in wax. Next week sees the opening of the #twitterartexhibit in Moss Norway where one of my painting will be displayed as part of a special twitter artist exhibition – more details can be read in this recent blog post about the event. Popular Crafts Magazine are featuring my artwork, coming up in June as part of their Jubilee issue, which has a photo project demonstration of me painting and encaustic Rose card, which Adrian photographed and I wrote for them. And Art In Wax is hitting the High Street, April also sees some of my paintings going on sale in store in Colchester Essex – more on this after the launch in a few weeks. I can’t believe where this year has gone! It has been an amazing year, I love my new found passion for painting in this wonderful medium – it is great fun, I love the way it flows and how I can create with it, pictures unlike anything I have before, the wonders of WAX!